If you can be bothered to get Quake III for Dreamcast working online, add one to this score. If not, subtract one. With the competitive shooter scene having been dominated by gritty, military pseudo-realism for much of the last console generation, it now seems like a lifetime ago that the lightning fast rocket jumping and circle strafing of classic PC FPS’ were the order of the day for serious online gamers. Leading the charge back then were the Quake and Unreal franchises, each offering their own unique takes on the massively popular paradigm. Their supremacy was such that SEGA successfully securing one or both of these for release on the Dreamcast was all but essential for the console’s lofty online ambitions to be taken seriously. 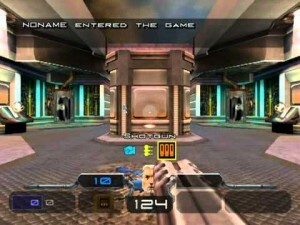 Although Unreal Tournament would eventually also make an appearance on the ill-fated console, Quake III: Arena beat it to market by around 3 months here in the UK. Back then, PC to console ports were often greeted with a fair degree of skepticism, as the technological gulf between the two formats was much wider than it is today. Thankfully, Quake III exceeded all expectations, losing very little in translation and arguably ushering in an era of renewed effort in terms of ensuring that console players would enjoy much the same experiences as their beige tower-loving brethren in the years to come. 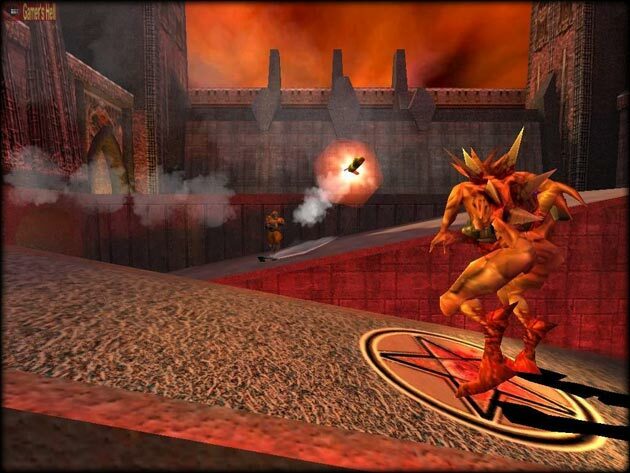 While the first and second Quake titles both featured respectable single player campaigns, it goes to without saying that the games’ messianic status among the online fraternity was thanks to their fiendishly addictive multiplayer components. Unsurprising, then, that id Software chose to omit a narrative entirely for the third installment. Strictly speaking Quake III does feature a single player mode, but all it really amounts to is a shooting gallery of preset matches featuring AI controlled bots intended as an entré for the main event. Quake III is incredibly fast paced; each and every design choice was clearly taken with a view to ensuring that a breakneck speed is maintained throughout. The game’s suite of weapons is varied and satisfying to use, and maps expertly streamlined. The bloody road to fragging success is not all that difficult, as long as you roll with the game’s trademark ballet of rockets, slugs and gib rather than push against it with habitual, overly cautious Call of Dutyisms. As regards controls, the transition from keyboard and mouse to pad has been handled as well as could be expected. The Dreamcast controller only has one analogue stick, so it is tasked with aiming duties, while the face buttons move your character around. Yes, the Dreamcast controller does feature a d-pad, but its positioning would make it almost impossible to use properly in tandem with the stick. Moving, shooting and jumping around with reckless abandon becomes second nature quickly enough, but inevitably lacks the accuracy of traditional PC input. It’s worth noting that the Dreamcast port does support the console’s own proprietary keyboard and mouse, but it’s difficult to imagine many players taking advantage of it, then or now. Graphically, in single player and online multiplayer the game is on par with PCs of the time, although some corners are cut in split screen. Most arenas are id staples such as gothic cathedrals and dark, throbbing space stations, replete with software house’s trademark grisly edifices of flesh and metal. Weapons and character models hold up even now, as do the effects and textures. The frame rate does chug on occasion, but not frequently enough for it to be a major problem. Interestingly, the Dreamcast port includes a hard rock soundtrack missing from the PC release. More curiously still, it’s actually quite good. With SEGA’s Dreamcast era multiplayer infrastructure long gone, you’d be forgiven for thinking that enjoying Quake III online via the console is now an impossibility. But, surprisingly, the game is actually still playable with other dedicated fans via private servers, although you’ll need either a Dreamcast Broadband Adapter or ISP that still supports dial-up to join in the fun. Moreover, expect to scour the Internet for specific server IP addresses, since the master list is no longer functional. If you can’t be bothered with the above hassle but still want to try playing the game with others via the magic of the information superhighway, there’s a mod for the equally wizened PC version of Quake III which adds Dreamcast exclusive maps and the aforementioned pleasantly surprising soundtrack. Forgiving gamers might find this an acceptable compromise, but it’s far removed indeed from the authentic Dreamcast experience. Plus, you’ll only be able to play with others using the same mod, of which there likely are precious few. The Dreamcast version of Quake III still stands today as a wonderful example of console porting done right, at a time when it frequently wasn’t. However, the additional hurdles that come with trying to get the game working online 15 years after release make playing it as intended all the more difficult. If you have the time, means or inclination to find others online to play with, it can still be a whole lot of fun. But if not, be warned: those bot matches won’t scratch your itch for long.